Four hundred protesters marched Thursday afternoon in solidarity with a loose national movement, which began in New York City under the “Occupy Wall Street” banner. 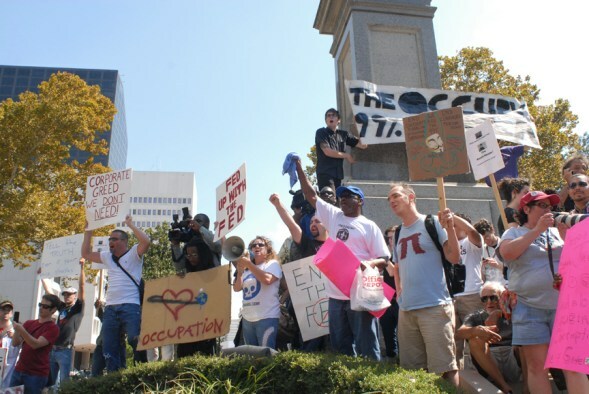 Like its national counterpart, the Occupy New Orleans chapter of the protest movement, which marched from the Criminal District Courthouse at Tulane and Broad to Lafayette Square in downtown New Orleans, has no formal leadership or appointed spokesperson, and arrives at all of its decisions through consensus. 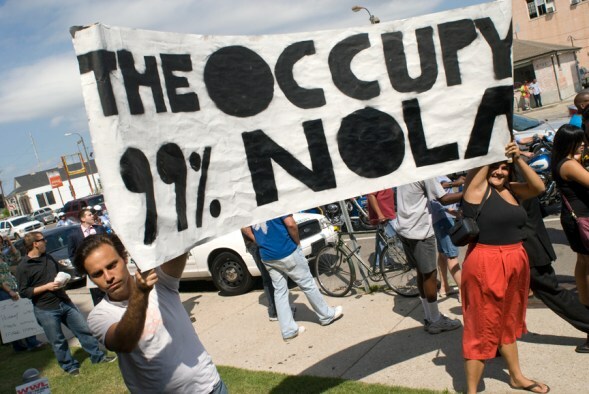 The group has attracted almost 5,000 fans on Facebook and on Thursday generated a steady stream of Tweets and photographs under the Twitter hashtag #occupynola. Click on any of the images to look at a larger version, or go to The Lens’s Flickr page to see a set of 16 photos from the protest. Protesters gather outside Criminal District Court on Tulane Avenue. Photo by Andy Cook. 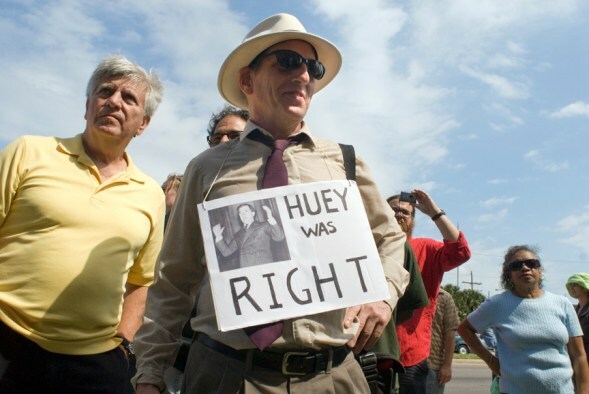 Louie Ludwig with his distinctive placard, a reference to Huey Long's "share our wealth" program. Photo by Andy Cook. 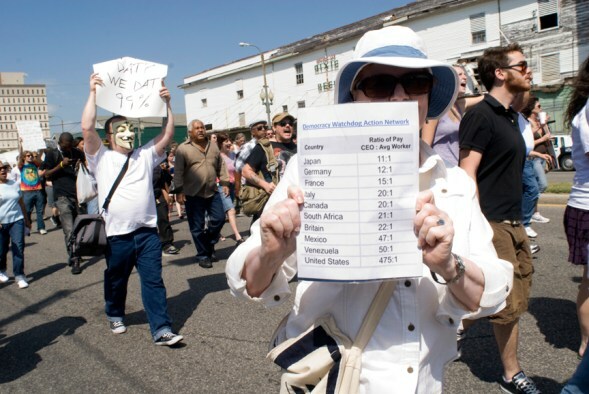 A protester holding statistics on CEO pay as the march moved down Tulane Avenue. Photo by Andy Cook. 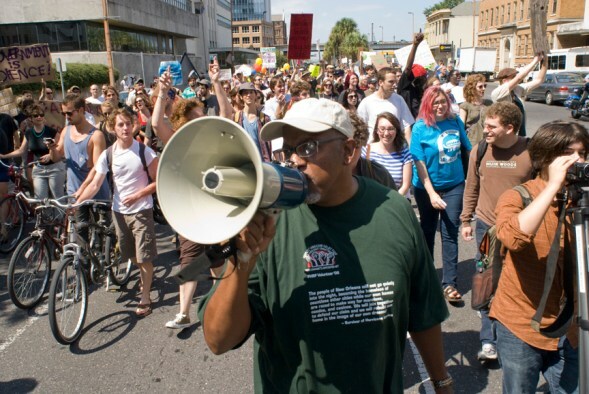 A protester rallies marchers by chanting slogans on Tulane Avenue. Photo by Andy Cook. From Lafayette Square, the group was headed to Duncan Plaza, opposite City Hall for a longer-term encampment. Much of the city’s leadership skipped the march to attend rites for Archbishop Philip M. Hannan, who died last week at the age of 98. The march stepped off at noon; the funeral began at 2 p.m. at St. Louis Cathedral in the French Quarter. News media divided themselves between both events and the march appeared to draw a larger and more diverse group of participants than many had anticipated. 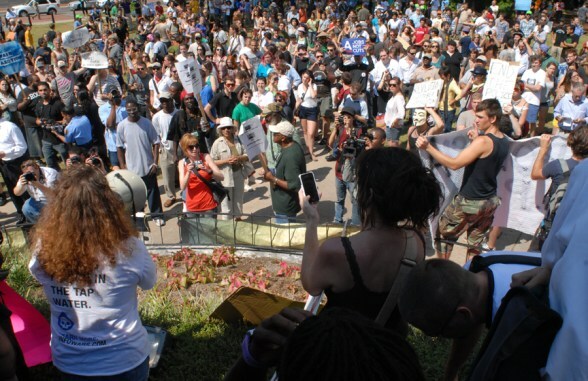 “I haven’t been in a crowd this big and politically engaged since the end-the-war protests eight years ago,” said University of New Orleans Assistant Professor of Literature Elizabeth Steeby. While many at the march were in their twenties, there were also plenty of middle-aged protesters. Music publisher Louie Ludwig, 52, in suit and tie, Rayban sunglasses and a fedora, wore a placard around his neck with a picture of former Louisiana Gov. Huey Long and the slogan “Huey was Right,” a reference, Ludwig said, to Long’s “Share Our Wealth” philosophy with its guaranteed social safety net. Civil rights attorney and public defender Miles Swanson sported a neon-green baseball cap with a logo identifying him as an observer working with the National Lawyers Guild. “The rumor is that the police waived the permit fees for this,” said Swanson who on Tuesday night at Loyola University trained 20 fellow legal observers. Police spokeswoman Remi Braden verified the fee waiver, and said the department has historically waived such fees for first amendment protests. The crowd, which numbered at least 400, gathers at Lafayette Square. Photo by Andy Cook. Protesters standing on the base of the statue of Congressman Henry Clay in Lafayette Square. Photo by Andy Cook. Rev. Jim VanderWeele holds up a placard in Lafayette Square. Rev. VanderWeele had just returned from the Take Back the American Dream conference in Washington, D.C. Photo by Andy Cook. Carolyn Mayes, who works at a home for women and children, handed sandwiches to hungry protesters in the park. Several marchers were keen to tell a reporter that they were not only gainfully employed but also had thought carefully about their reasons for joining the protest. 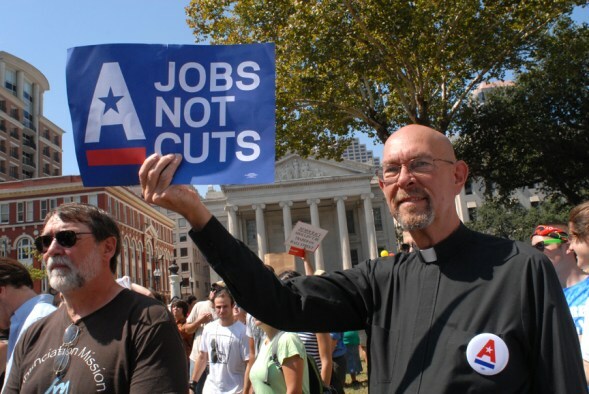 It was an effort to refute national media coverage which has characterized some of the protesters in other cities as unemployed young people with nothing better to do. “We have a huge corporate welfare system in this country and it’s harmful to small businesses, and to people,” said Shana Hartman, who works at a nonprofit focused on economic development. Not everyone was as positive about the march, however. Twitter user @MarkMayhew on the eve of the march lamented its likely dominance by white people, despite the city’s 60-percent African American population. “i hope i’m wrong but all @occupynola meetings have been overwhelmingly white, until blacks support it, it’s easy to dismiss,” Mayhew tweeted. Indeed, the march attracted some stereotypical “trustafarians” — a slang term for trust fund-endowed young people given to dreadlocks and other hallmarks of the Rastafarian style. A white man with dreads played the saxophone in Lafayette Square, and the predominantly white crowd sang Bob Marley’s protest song, “Get Up, Stand Up,” as it marched down Poydras Street. John Rebstock, who manages a branch of Rotolo’s Pizzeria at the Mercedes Benz Superdome, stood with two friends in a parking lot on the corner of O’Keefe and Poydras streets as the march passed. The messages were decidedly mixed. An unemployed 26-year-old who gave his first name only, Bowen, stood on the base of the Henry Clay statue in Lafayette Square with an attorney’s number written on his arm, a sleeping bag for the Duncan Plaza encampment and a black and gold banner that combined the Saints team logo with an anarchist symbol. “I wanted something simple, something visual, something nice,” he said. But the movement doesn’t lack coherence, Bowen argued. Nearby, another anonymous protester wore a gas mask, and gave her name as Buick MacKane, after the song by T.Rex. “It’s hard to breathe in this thing,” she said, before pulling off the mask to reveal black eyeliner and a broad smile. “MacKane,” who said she occasionally reviews music for Where Y’at Magazine, had brought along her own handwritten manifesto to ensure that she, at least, was clear about her beliefs. The Lens wants your impressions of the protest, and has created a query through our partnership with the Public Insight Network asking whether readers identify with protest goals and messages. You can answer the query by clicking here. By responding to the query, you will become a part of the PIN network, which reporters across the country draw on to contact members of the public willing to be sources for their stories.